With the stress on Adelaide’s overloaded public hospital system showing no sign of abating, Warren Jones explains what the State Government must do to fix a system in critical condition. The key problem in our public hospital system is that there are not enough in-patient beds. This causes ‘bed-blockage’ leading to overcrowding of hospital facilities, overloading of emergency and outpatient departments, ambulance ramping, and escalating waiting lists for elective surgery. This has been caused by the previous State Government’s disastrous Transforming Health agenda. Access to acute care in-patient beds was reduced by the downgrading of Modbury, Noarlunga and the Queen Elizabeth Hospitals, and the closure of the Repat removed a net 120 beds from the southern network. This is unsustainable in a system struggling to meet the health needs of an ageing population and the inexorable 3 per cent per annum increase in demand for hospital care. The whole problem is exacerbated by the many patients – the elderly, chronically-ill and those with a disability – who are stuck in the hospital system due to deficiencies in home, community and residential care facilities. Responsibility for these shortcomings are at federal and state government levels and include the flawed roll-out of the National Disability Insurance Scheme, access to nursing home beds, and the decimation, some years ago, of the South Australian Domicilliary Care Service, which was the envy of the nation. One important component of reducing hospital admissions is primary health care and disease prevention, but this, along with rural health and mental health services, was ignored in the Transforming Health review. The current State Government is taking significant steps to address these seminal issues. The closure of the much-utilised Community Health Centres by the previous Government removed a valuable source of public health information and education in a primary care setting. I hope that consideration will be given to re-establishing these facilities. However, the other side of the health care equation – the critical problems in access to beds and other hospital facilities – remains at the core of the current difficulties. 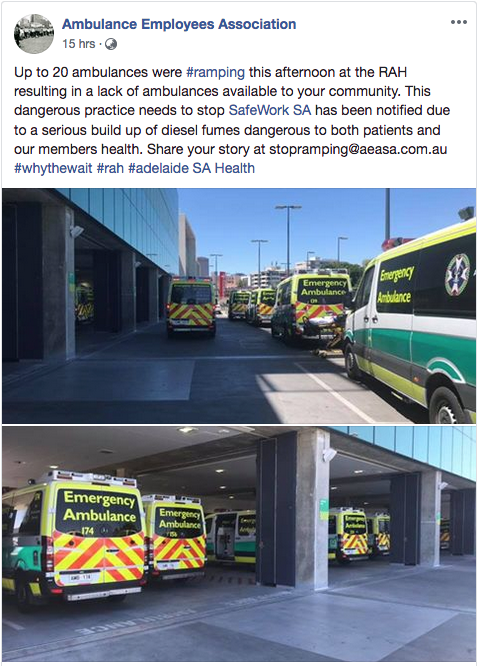 A Facebook post from the Ambulance Employees Association, uploaded late yesterday. In addition to the more overt deficiencies in the wider system, the new RAH has substantial problems of its own. These derive from the loss of important specialist services in the translocation of the old to the new hospital, and its dysfunctional design which has prevented the efficient and timely flow of patients through the various services. Structural alterations and revised work practices will reduce, but not eliminate, these problems. The full utilisation of the bed complement of the new RAH is yet to be realised 17 months after its opening. This is due to the inordinate cost of staffing and servicing uniformly private room accommodation in this unnecessarily luxurious hospital. In a crisis plan to the overcome the shortage of beds in the RAH and its poor cousin, the Queen Elizabeth Hospital, the Central Health Network will shortly outsource the care of 800 public patients on long-term elective surgery waiting lists to private surgeons operating in metropolitan private hospitals. This is an extreme example of the sort of piecemeal “fiddling-around-the-edges” strategy employed by the Government in an attempt, not so much to solve the overall bed shortage problem, but to assuage public opinion. The outsourcing of the surgical treatment of public patients into the private sector was instituted by the previous Government and has been perpetuated by the new Government as a default alternative to definitive solutions. All public joint replacements in the South are now performed at Flinders Private Hospital and other metropolitan private hospitals are being used for the treatment of public patients across the system. The current strategy of ‘farming out’ of post-operative patients to peri-metropolitan and country hospitals is cumbersome and disruptive to patients and their relatives. Equally, the parking of long-term and chronically-ill ‘awaiting placement’ patients, and patients with a disability, in Hampstead Rehabilitation Centre, St Margaret’s Hospital and the inadequately re-constituted Repat campus, does nothing to solve the longer-term problems. The solutions to the bed crisis will only come when community and home care capacity is increased and acute care beds and other support services are re-opened at Modbury, Noarlunga and the Repat. We are seeing some movement in the repair of our hospital system, but the Government’s election commitments in these areas must be fully implemented without delay.